The idea of public service is rooted in endeavors meant to connect with, benefit, and apply to as much of a general populace as possible. 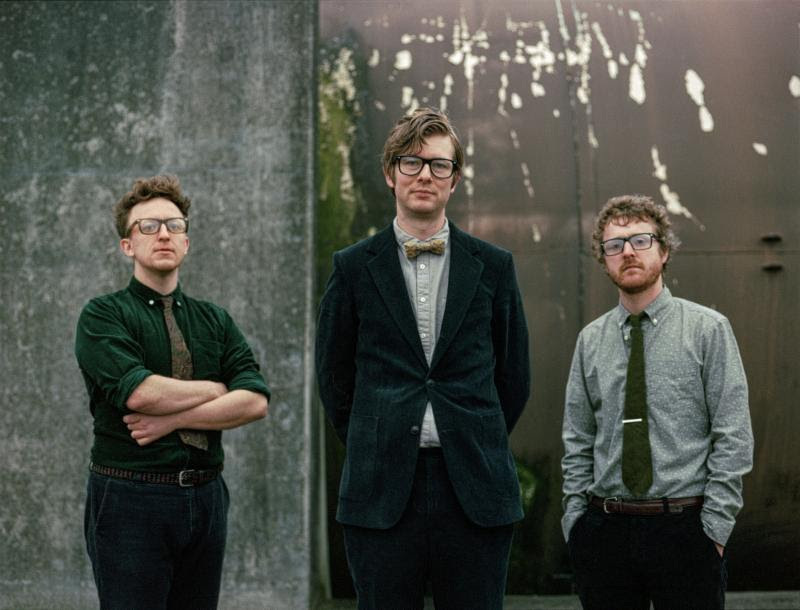 Though London, England based band, Public Service Broadcasting is fundamentally a musical group, as opposed to an altruistic organization, its creative output to date has certainly functioned as more of a public service in terms of shedding light on, and cultivating increasing interest in, real events in human history. It can be difficult to describe this band, since their signature incorporation of non-musical media – primarily audio clips from long archived recordings of things like public speeches and preserved interview sound bites – makes the default stylistic identifiers of post-rock and electronic, feel wholly inadequate. 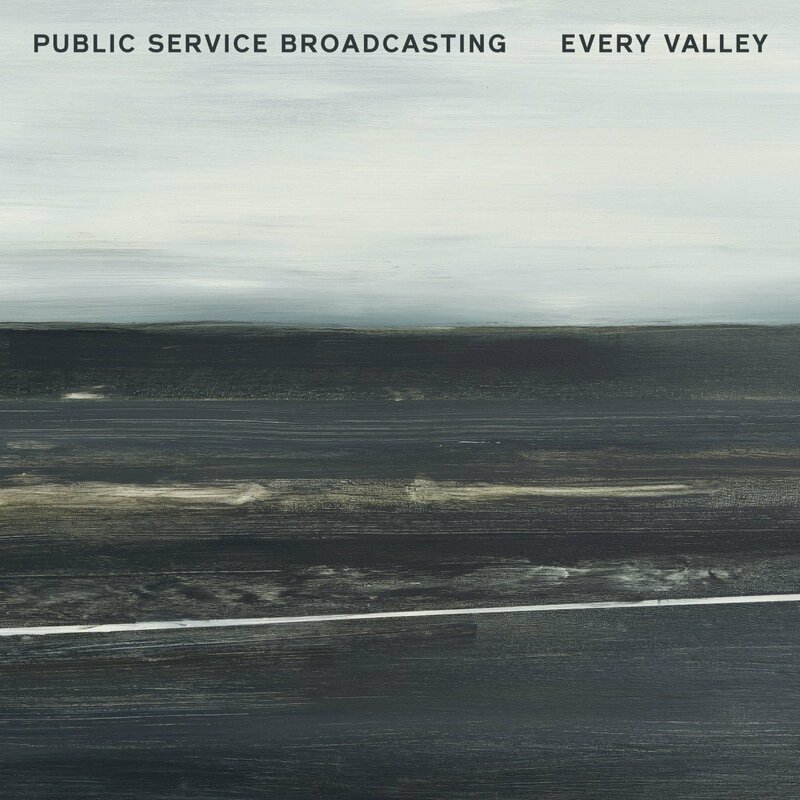 Approaching this band means internalizing that its inclusion of true life historical media within albums is not a dressing or a lightning strike of an idea for making Public Service Broadcasting stand out. Three records in and founding member, J. Willgoose Esquire (vocals, guitar, synthesizer) Wrigglesworth (percussion), and J. F. Abraham (bass, electronics, trumpet), have solidified that their band is not simply for sonic enjoyment but also equally, if not more, for generating intrigue around entirely non-musical facets of life. While inspiration and motivation behind sophomore album, The Race for Space (Test Card Recordings, 2015), encompassed the specificity of the surge in U.S. and Soviet space travel between the 1950s and 1970s, Public Service Broadcasting has let its focus descend from orbit on new album, Every Valley (PIAS Recordings, 2017). Here now, the band pays homage to the rise and fall of the coal mining industry in South Wales – a much more localized aspect of global history but one that the English trio tackles with no less informative scrutiny on their journey to illuminate this piece of the past. Locally speaking, it is a 45 minute crash course in Wales’s past industrial transformations but more broadly, the album grazes globally relatable nerves connected to class divides, social norms, and the fear of obsolescence through change. Furthermore, the chronologically wide relevance of these general themes demonstrates that Every Valley can cross multiple dimensions: micro and macro society, past and present conflict, and instrumental capability. Similar to its predecessor, Every Valley gleans some of its historical core material from the British Film Institute, which is home to a cornucopia of government created and preserved audio-visual media. During this expedition through its massive archives, Public Service Broadcasting delved into material outlining the acme and descent of coal mining in the Welsh countryside but J. Willgoose Esq. didn’t stop there. Noting the extensive list of informative records and expert individuals tapped for research insight (The National Coal Board films at The BFI, independent documentary, “The Welsh Miner,” and audio tape from the South Wales Miners’ Library at Swansea University) and even interviews fostered by J. Willgoose Esq. himself and recorded on the album (as is the case for the secretary and caretaker of the local branch of the National Union of Mineworkers), the labor intense footwork required for the conceptual foundation of Every Valley makes the record feel more like a doctorate research paper that happens to have original music behind it, than vice versa. Nonetheless, there’s still plenty of musical and artistic effort to be applauded with Every Valley, starting with the sheer fluidity generated between the album’s spoken audio and the band’s compositional element. After The Race for Space’s theme lent itself so ideally to the digitally dominant style of Public Service Broadcasting’s writing, seeing how the band managed to renegotiate the place of electronics within what is presently a much more organic subject matter, is one of the big markers to establishing Every Valley as uniquely crafted, as opposed to formulaically super imposed. A massive team of contributing players, almost like a small society of their own, imbued Every Valley with a rainbow of acoustic colors from the likes of cellos, tuba, french horn, glockenspiel, and even accordion. Artificial touches ring out though the antimonial tones of the guitars on tracks like “The Pit” and the more lyrically self-explanatory and electronically focused single, “Progress (feat. Traceyanne Campbell).” However, even with parts having electronic qualities, the way Wrigglesworth and J. F. Abraham shape the dynamics and performance styles of their parts together – pulsating cyclical drumming and expansive, sustained notes – make even metallic timbres feel appropriate in the way they embody sonic heaviness on the former track; enhancing the layers of thick and unrelenting sounds, depicting sheets of dense earth and keeping key thematic imagery at the forefront. In light of the complex socio, economic, and geo-political aspects of Every Valley that are so straightforwardly dictated to listeners, the impressive complementary abilities of its instrumental and artistic counterparts demand more attention to extract their matching awe. Knowing that Every Valley – from the moment one observes its subdued cover art to the fade out of chorally-powered gem, “Take Me Home” – is bigger on the inside in more ways than one, J. Willgoose Esq. offered added depth to the roadmap of Public Service Broadcasting’s newest vessel connecting history with today. Kira Grunenberg: What made you decide to put Welsh coal mining at the center of “Every Valley’s” conceptual core? The parallels to hot button issues of today, which extend across the pond here in the U.S., are prevalent to be sure. However, many other issues are playing out in similar fashion as well. Why this? J. Willgoose Esq. : “[The decision was for] partly pragmatic reasons, in terms of what material what readily available – certainly from the British Film Institute – to [have to] re-work it a lot. And that was kind of a jumping off point for [the idea that] maybe we could do something about coal mining, maybe we could do something about industrial heritage, or industrial decline. And just, the appeal of doing something less obvious and less kind of, commercially appealing I suppose; [and less] instantly [so] than the space race. And maybe something was a bit more of an ambitious and bit more of a difficult subject to tackle, and just something that would kind of, stretch us. All those kinds of things pushed me in that direction in the first place. And then yeah, the more I researched it and the more the album started to shape itself in my head as being as much about community as about [the] actual commodity I suppose, that was when the geographical framing of [the album] started to sort of come together – focusing solely on South Wales. And as the album was coming together, and as I was doing research, events were taking place in the world: the Referendum here [in the U.K.] and the presidential election over [in the U.S.,] it did seem like it was becoming more and more timely and more and more relevant to what was going on today. It didn’t seem that way when I started there. It just kind of gradually headed down that road; to the point where I think it was really well timed but in a quite accidental way I think. Kira: What’s something that really left an impact on you when conducting the interviews for Every Valley that, perhaps lacks a direct correlation on the finished album? J. Willgoose Esq. : Well, the reason for doing [interviews] was partially to keep what we do feeling fresh and [to] change the way we work, I suppose. And also because something like this seems kind of a bit more pertinent and present and still something that a lot of people in the area are dealing with. It felt like it would be remiss not to address, you know, directly address it, and sit down with some people and get a first hand account because you really can’t beat that in terms of getting a feel for subjects. But in terms of meeting some of the people that we’ve met, there’s been quite a few moments where I think overall, the thing that just really impressed me the most was, or what was impressed upon me the most was, just how open and welcoming and sort of encouraging people were of me being very much an outsider and sort of talking to them. From speaking to the guys at the N.U.M. – the National Union of Mineworkers, speaking to them after the fact – they said some really nice things about us and about [“Every Valley”]. I got in touch and said, ‘You know, thank you so much. Thank you again. It was incredibly kind of you to sort of put up with me in the first place and extend your welcome and your support and your time.’ But to get that level of engagement from them I suppose, and for them to see [the album] was coming from a genuine place from us, as far as we were concerned, and that we weren’t doing it for weird cultural ploys and reasons. Yeah, it’s a special part of the world…and I don’t think I quite realized that until I started spending a bit more time there and certainly with the people there. There’s just, there’s something about the people from that part of the world. They’re very open and very friendly and yeah. It’s not really like London in some ways, at all. Kira: The album really brought these two very unrelated worlds together. I’d say it’s a mutually beneficial endeavor. J. Willgoose Esq. : I hope so! I mean yeah, that’s part of just the way that we work and what we end up doing is mutually beneficial for us and the [film] archives because we have to pay for transfers from the original 35mm film to digital and some of the stuff hasn’t been digitized yet so in its own way we’re kind of helping to preserve the archive itself and use stuff that has just been lying on a shelf somewhere for quite a long time. It all feels like quite a healthy thing to be doing. Kira: What does the band aspire to look like, and to represent, going forward? Keep with socially conscious “historical rock” or recede back from it on the next album? Perhaps go an entirely new route? J. Willgoose Esq. : I don’t know; I mean, social consciousness, yeah. But this record is very much, you know, I think it’s us starting to engage with that sort of thing much more explicitly. Even if the album itself, you know, I don’t think we’ve been massively didactic in terms of telling people the messages that they have to take away from it. But certainly the subjects that we’re engaging with are very, you know, well, they are social issues I suppose, and lingering social issues as a result of historical roles being perpetrated on the community. I think the key thing is always to keep changing things and not change it too much so that you don’t kind of totally alienate people and lose people you’ve spent quite a long time kind of getting on board. You know, if you look at the kind of turn from The Race for Space to [Every Valley], I probably think we’ll make another turn after this record and focus on something else that’s equally interesting but possibly in a different way. Again, maybe change the way we work and who we work with and, yeah. I don’t want to be a band that sort of stands still. All the people that I like don’t do that so, you just try and copy the people you like I suppose, in that way. Kira: The way you guys move from album to album kind of makes me think of book series wherein every volume sees the stories set in different places but the main characters stay the same from installment to installment. Those kinds of works can definitely develop a solid fan base and I see that as where you’re kind of going and that’s exciting. J. Willgoose Esq. : Oh yeah, that’s great! I’m glad you can see that. I think we can kind of be the constant, like, at the core of it and have our own changes and growth. Like adding a third member, which we’ve done for this album and kind of thing and sort of expanding the musical sort of palate, I suppose. But I think you know, in terms of who we are and the way we look and all that, we can be relatively constant and everything else can kind of change around us. Yeah, that’s kind of the way we’re trying to go. Kira: Given how different The Race for Space and Every Valley’s concepts are, how would you say you discerned what you were aiming for in terms of mixing and production values between the music the band creates and the audio footage selected for the songs going from the former record to the latter? J. Willgoose Esq. : Well, I mixed the album so I guess it’s a bit of some subconscious, some unconscious, in terms of how you sort of, get [the audio clips] to match the rhythm of the piece or match the timing of the piece. I think probably with The Race for Space, there are a few aspects of it that lend itself to letting samples sort of work rhythmically. The most obviously place is probably with “Go!” with the chorus there and cutting it so it all on the beat and on the snare, etcetera and timing it so it kind of becomes the chorus in a way. I think with [Every Valley,] because it’s a more abstract subject, and because – you know I think there’s a lot fewer samples and I haven’t counted but I think there’s probably a lot less sampled material on it – it felt like it could be a little bit more um, more kind of indistinct I suppose, and less kind of [a] rhythmic presence and more sort of lyrical and just kind of lilting in a sort of strange way; in the way that the Welsh accent sort of lilts and has a sort of nice musicality to it anyway. That was probably you know, about as far as I got thinking about it. I think there’s less of [the sampling] on this album so I think it’s less of a central feature but still important to try and make sure it suits the mood of what you’re working on. Kira: How does it feel to present music to the world that, with its many layers of deep and complex narratives, so drastically stands apart from the trend of ever-shortening prioritization and attention spans of music lovers across the globe? J. Willgoose Esq. : I think we are, we’re certainly a long way from the way most pop music works these days; you know, mostly singles and sort of a lot of streaming nowadays. Now I think if you look in the U.K., how many sort of physical albums we sell, compared to digital or in streams, it’s still something like 75% physical [sales,] which I think shows that the people who are into us are actually like the idea of an album as a concept and something that is more than just a collection of songs all recorded at the same time; something that is a body of work that is trying to say something. And if you’re sort of operating outside the mainstream, both musically and in terms of the way that you’re kind of packaging and delivering your music, then you’re taking a bit of a risk but at the same time, because there’s not that many people doing what we’re doing, in the way that we’re doing it, with such a kind of clear narrative hook I suppose, I think it does sort of help us stand out. I think you just have to look at how the record did over here [in the U.K.]. Where it ended up in terms of the charts, it’s extraordinary for an album [that’s] mostly instrumental, about the history of Welsh coal mining. It’s not what you’d expect to be landing in the top 10 of the charts and I think that just goes to show that there is an appetite for it. You just have to give people credit. You have to give them the benefit of treating them like intelligent adults and they will find you and they will come to you. You don’t have to spoon feed everyone. There’s a large audience out there waiting for kind of interesting, more sort of heavyweight material. There’s still sort of a very mainstream element to what we do; we’re by far a long way form the most out there people making music but at the same time, we are different in some ways…I just think it shows that if you make something that has enough depth to it and enough thought it going into it and it’s been shaped and put together in differently built way, people will find it and hopefully enjoy it. And that seems to be what’s happened, certainly over here. Kira: What kind of lesson are you hoping people learn after becoming aware of these voices on the album and who, if you could bring it specifically to their attention, would you want to hear and ultimately learn from this record? J. Willgoose Esq. : I think you have to be a little bit careful with that because one of the things you learn when you sort of start creating stuff, actually dole it out and connect with people and it has a kind of life of its own, you learn how weirdly kind of divorced from it you become and how it just doesn’t seem like its yours at all and it does belong to the people who are listening to it and are having their own relationships with it. You know, it’s weird, looking back at something like [the single] “Spitfire” now, it’s probably now must have written it, best part of five and a half years ago and you know, I can listen to that song on the very rare occasions that I do and it just doesn’t feel like anything I had any involvement with. It’s just kind of gone to become something else entirely. It doesn’t even seem like I wrote it in a way. It’s a really strange kind of ownership that happens once you actually release something like that. And for that reason, you know, I think we tried to let people kind of find own way through the album in terms of you know, any kind of overarching message and not kind of wanting to beat people over the head with any kind of, ‘You have to take this out of it,’ or, ‘You have to take that out of it’. You can kind of hopefully pick your own way through it and whatever your political alignment, find something in it. That was kind of very deliberate, one of the things that was very deliberate I suppose; taking the more personality politics based things – the more purely party lines politics – out of it and removing key figures like [Margaret] Thatcher and Arthur Scargill, head of the miners union, [and] not having them anywhere on the record because it’s not about them and it’s not about their kind of role in shaping that time. It’s about the people and the communities that we’re writing about, at the end of the day. And these things probably would have happened with or without those people’s involvement. But yeah, in terms of an audience to try and find? It’d be nice to kind of think that maybe for some younger people who haven’t really paid that much attention to this, certainly in this country, and maybe kind of draw a dotted line from what happened back then to how some of the areas involved in that voting to leave the E.U. – despite the fact that they get a lot of their funding for it – maybe for that kind of a thing we would be performing a kind of service in that way. But you know, that’s not to say somebody might not just buy the album and like it just because they melodies on it or whatever. It’s not really for us to decide, I think. Kira: What about New York City do you most enjoy and are looking forward to on this return visit? J. Willgoose Esq. : I know it’s probably a cliché but there is something in the air in New York. There’s a kind of energy and a kind of excitement and probably more so in the 80s and 90s, a sort of slight danger attached to that as well, coming from the outside. There is just this energy. It’s very hard to put your finger on but it feels like a special place. I don’t get that feeling in many other places in the world. It is unique to New York I think. And I think it’s what draws so many people there from all over the world and already has drawn there for hundreds of years. But, yeah, it’s just such a fascinating place to spend some time. Everything seems on such a ludicrous scale. I mean, even having grown up in a city like London, which is one of the largest and biggest, most developed cities in the world, I think you could probably say but, to come from that and sort of be dropped in the middle of New York and still think like, ‘Buddy, this is big,’ that is the kind of difference in scale that is remarkable and it just feels like an exciting place to spend time so, looking forward to coming back over. Kira: It must be nice, to be able to say just being there is what makes it for you – not having a specific laundry list of things you need to do or see to get something significant out of it. J. Willgoose Esq. : Yeah, just walk about and try and get a feel for a place rather than have some arbitrary tick list of, you know, things I’ve got to do or my life isn’t complete because…oh well, that doesn’t really work for me. Like, ‘Oh yeah, I’ve done New York’. Who’s “done” New York? Nobody’s bloody done New York, don’t be ridiculous. Kira: Lastly, I always like to get a sense of the relationship between musicians and their gear – especially if the tools at hand are predominantly of the electronic and digital nature. What is your favorite piece of equipment to use when you play and why? J. Willgoose Esq. : It’s probably not one piece of equipment. I think it’s just the guitar in general as a machine. It’s just it’s remarkable how much you can get out of it, for what it is and how sort of inspirational it is. Even just picking up a different guitar, it just kind of asks you to play in a different way or if you tune it in a different way you end up writing something in a different way. Yeah, it just seems like a whole world of possibilities and it doesn’t ever seem like you’ll master it or get everything out of it. There’s so much room to get better at it I suppose. You know, I do write a bit on keys as well and other bits and pieces but most of it, the record, is fully written on guitar one way or another and moved to other instruments and sort of rearranged I suppose. But yeah, I think I would sort of struggle to write anything without using it – certainly anything I was happy with. There are certain guitars you feel you feel you sort of have a particularly strong bond with I guess. I was kind of surprised at how much I ended up using this, well, kind of bought a strat for [the track] “Gagarin” basically. I thought, ‘You gotta have a strat for this song because it’s…there needs to be a strat. You can’t play this kind of song on anything but a strat. And I didn’t think I liked both guitars at all but I ended up really, really falling in love with it and it ended up being on more stuff on [Every Valley] than anything else I think so, maybe that one more than anything else at the moment just because I was, I was quite close minded against it myself and it’s always nice to be reminded that you’re wrong, I suppose. Public Service Broadcasting will be touring throughout North America, starting in Philadelphia, PA and will be playing at the Music Hall of Williamsburg in Brooklyn, NY on 13 September 2017. Full show and tour details are below! Every Valley is available now through iTunes, Amazon, and streaming on Spotify.